When you’re looking for that great Blowout Bar Hair Salon for your night out or to get set for the work week. Nela Hair Stylists are here to provide you with exceptional service. The talented stylist at this Tenafly Salon are experienced in working on all types of hair. Whether you have curly hair that you want straightened, smoothed and waved or if you have fine hair that needs body, volume and texture, they have you covered at our Blowout Bar Hair Salon. Why Blowout Bar Hair Salon? Every blowout is custom and is done to compliment the individual. Based on personal preference, hair types, maintenance and products used. 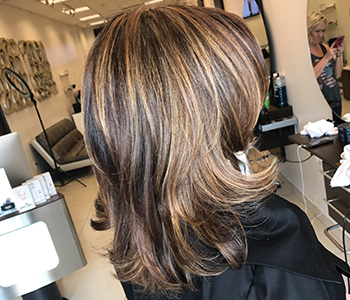 The experienced hair stylists at Nela Hair Salon are here to educate their clients on what it takes to get the perfect blowout. It starts by a consultation. First, taking a look at the hair in its current state. Second, Feeling the texture. Then, Asking questions. It is very crucial from both parties. A talented stylist will always ask their clients as many questions as needed to achieve the best outcome. Knowing as much as you can about the client’s hair, lifestyle and their at home maintenance is very helpful. There are many factors to getting the perfect blowdry that will last, the texture of the hair. Whether they have an oily or dry scalp are just a few. Knowing what products to use will take the blowout to the next level. Nela Hair Salon uses an array of professional hair products. Blowout Bar Hair Salon uses only organic, paraben and sulfate free for many different hair types. Upon consultation the stylist will know what shampoo will be right for your hair. Therefore, what styling products will follow to prepare for and finish the blow dry, as well as any at home maintenance that is needed. When looking for the right blowout bar near me, think about these factors and you’ll know where to go to get your hair done.